Learn how to manufacture high-quality sports, health and well-being products using efficient, safe, proven powder handling equipment. How Does a Matcon System Compare? How to Start Sports Nutrition Manufacturing? How to Get a Head and Stay In Front? Learn how to create Sports Nutrition products in an efficient and flexible way. What powder handling equipment do I need to create sports nutrition products? Matcon equipment enables Sports Nutrition Manufacturers to stay ahead in a competitive market. Our systems are designed to run all of the necessary process steps simultaneously, increasing your production capacity whilst offering improved flexibility. Sports nutrition manufacturers must now produce an ever-expanding portfolio of products. This often means multiple recipe changeovers, which can impact production efficiency and output. As the product portfolio expands, so does the list of ingredients needed for your recipes. 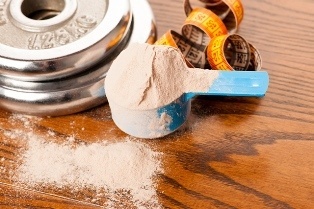 Many of the powders handled in sports nutrition, such as protein powders can be difficult to process in bulk as they are sticky and therefore poor flowing. 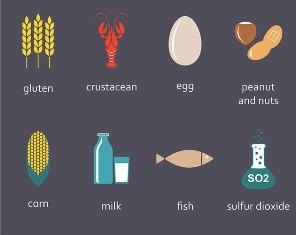 Allergen cross-contaminating is also a serious risk as recipe changeovers increase. 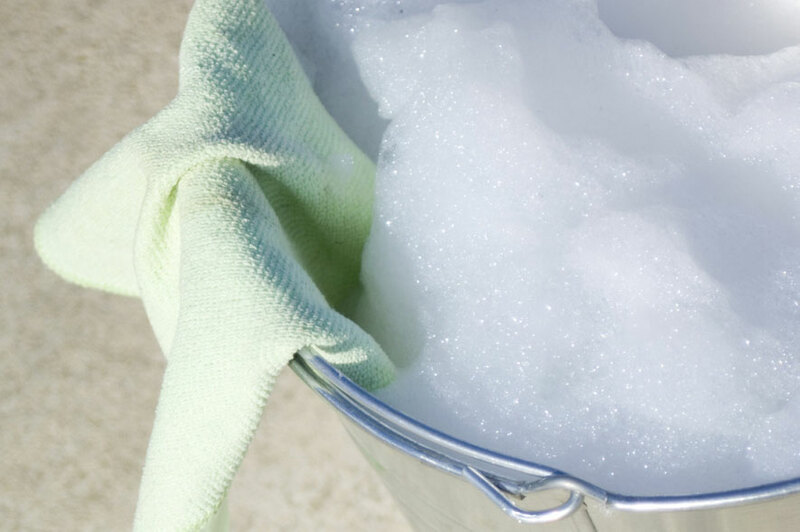 This could mean you are spending more time cleaning. Matcon systems are designed to optimise production flow. All of the required process steps are performed at separate modules, occurring simultaneously. Our Cone Valve, unique in design and contained within each Matcon IBC ensures your materials are discharged correctly following the blending process. Using IBCs for ‘In-bin blending’ will reduce the amount of downtime that is caused by cleaning and also remove the risks associated with handling multiple ingredients. There will be no longer be the need to worry about cross-contamination. A Matcon IBC system is suitable for all sizes of Sports Nutrition Manufacturers from start-ups to leading market providers. We are proud to supply market leaders in sports nutrition across the globe with a range of IBC systems. It can be difficult to realise the benefits of a different system. Our video demonstrates how two different systems compare when manufacturing the same products. View our system comparison video to see how a Matcon approach delivers a higher ROI than a traditional fixed line mixer system. In the competitive sports nutrition industry, you must have a manufacturing system that provides you with the ability to manufacture multiple batches - efficiently and safely. If you have the ability to change recipes, clean down and run other batches simultaneously, then you will not only keep pace with a demanding marketplace but remain one step ahead of your competition. View our short film to see how a Matcon system compares with a traditional fixed-line mixer system. Both are producing the same recipes and batch sizes but the time savings are obvious. 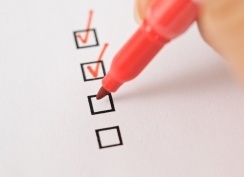 Learn more about increasing your output and future proofing your manufacturing process. 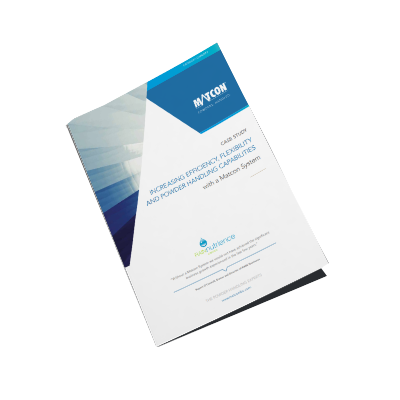 Download our free guide. Learn more about Matcon's flexible manufacturing solutions with this useful resource written for sports nutrition manufacturers. The challenge of manufacturing multiple recipes in one day can be solved. How can I start manufacturing sports nutrition products? As the health and well-being industry grows at a rapid rate, new providers are looking to enter the market. With market growth comes increased competition and wider product variety, as both garage entrepreneurs and leading sports nutrition manufactures look to secure market share. Those manufactures looking to scale up production need the correct manufacturing equipment that will help them manufacture their products in a cost-effective way. Whether you are a start-up or established provider you can benefit from lean manufacturing by increasing production, reducing waste and ultimately maximizing profit. 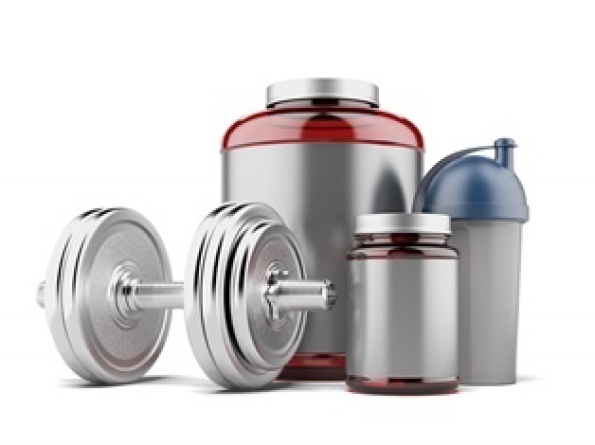 Whilst some manufacturers in the nutrition and well-being industry focus on high volume production of single products, many sports nutrition manufacturers must deliver small batches of a variety of products, efficiently and in line with their finances. As most producers now manufacture and deliver products covering everything from energy gels to protein powders, fast effective changeovers are needed. Regular recipe changes and varied batch sizes can be large amounts of downtime whilst equipment is being cleaned and re-fitted, but those using a Matcon system can reduce waste and minimise downtime. Efficient materials handling leads to less waste and higher OEE. Most sports nutrition products are developed by those who have a passion for the industry. The thought of long-term production efficiency is not always something to think about when you are starting out. As your products succeed and you experience growth the marketplace becomes more competitive. Those manufacturers that want to scale up their manufacturing efforts will soon find that their material handling and powder processing equipment is an area that needs attention. Read the Case Study to discover how Sports Supplements Manufacturer RAIN Nutrience doubled production rates and future-proofed their manufacturing facility without the need to add to resource overheads or increase factory space. Don't get left behind with a limited system that holds you back. Where do you start and how do you scale up production? As your business grows your thoughts can move from how to start manufacturing to how can we grow in an instant. Small-scale sports nutrition manufacturers can grow quickly and with that production output and efficiency must improve. 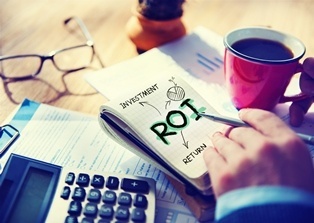 To ensure that your business gains a competitive advantage, there are some main factors. 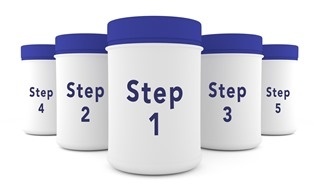 Ask you grow you will need to consider where you will store ingredients and what additional powders you will be handling as part of the manufacturing process. Whatever the product, it is always worth having expert advice from an experienced solutions provider for the sports nutrition industry. Make sure you remain ahead of your competition in the sports nutrition industry. 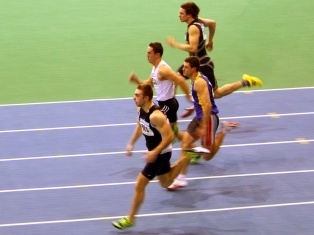 How can you get ahead and then stay in front? As the sports nutrition industry continues to grow, the opportunity for manufacturers increases. Having one leading product may not be enough. You will soon need to deliver larger volumes of one or more products. Scaling up your production can be difficult, especially when you only have limited factory space and investment. That's when IBCs give you an advantage, ensuring that you increase flexibility and adapt as consumer preferences and demand changes. Increasing output and efficiency without losing quality will keep you ahead in a competitive market place. Increase production capacity, efficiency and don't reduce product quality. The sports nutrition industry is now big business with everyone from serious athletes to health conscious shoppers regularly purchasing a wide range of products. With such a wide range of customers, requirements and demands a flexible solution is a must. Matcon provides a range of innovative solutions to meet such demands, enabling sports nutrition manufacturers to quickly and effectively switch between the production of flavours and batch sizes without the risk of contamination. Having the right accreditations is a mark of quality and recognition of expertise. Do accreditations help sports nutrition manufacturers to secure more sales? Having the relevant accreditation can not only demonstrate a high level of quality but build confidence in your brand. In a competitive marketplace such as the sports nutrition industry, brand reputation is everything. Once you have built a loyal customer base you must do what you can to make the most of the opportunity. Having the right equipment will mean that you can consistently manufacture a high level of product, perform regular quality checks and create an environment that promotes excellence. High manufacturing standards make gaining accreditation easier so it pays to know the best equipment for the job. Contamination from potentially harmful allergens can lead to serious problems for customers. 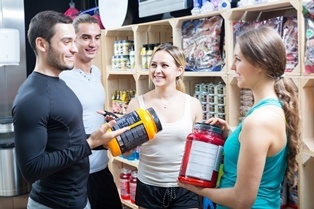 As product integrity becomes more of a focus for sports nutrition manufacturers must know exactly what is going into their products and what will end up in the hands of the consumer. With wheat-free, dairy free and vegan diets also becoming leading consumer trends, manufactures in the health and well-being market must deliver on quality but without sacrificing production efficiency. Discover how IBCs can support manufacturers looking to establish clean, cost-effective production lines and meet the demand of consumers without sacrificing return on investment. Speak to our experts who have experience of working with the largest providers across the industry. Are you looking to justify spending your budget on a new blender? Whether you are a start-up business or an established sports nutrition manufacturer, you need the most efficient equipment that guarantees a high return on investment. Many of our customers want to become more efficient, running a leaner operation but maintaining a high-quality product. Whether you work in the sports nutrition industry or pharmaceuticals, food or even animal nutrition, your equipment must enable you to produce high-quality products in a cost-effective way. To help you discover cost savings at the industrial mixing stage, we have developed an easy to use ROI Calculator. 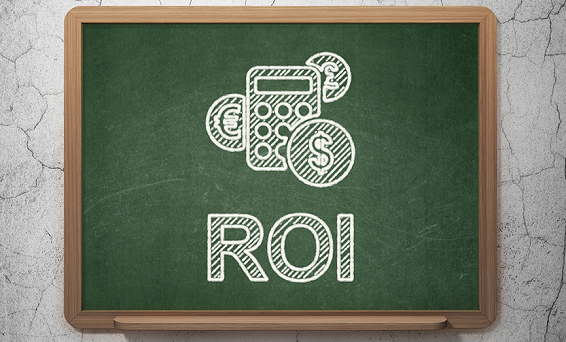 To use the calculator you will need to enter a few simple values which will enable you to calculate the ROI that a tumble blending process will deliver. Think of all the others things you could do if you weren't cleaning? All sports nutrition manufacturers need to change over recipes, which ultimately means time must be spent cleaning. When using a fixed line, cleaning usually results in downtime where you are not producing product. If you had the ability to reduce the time you have to spend cleaning and increase the time you can be in production then your output will improve. We estimate that some manufacturers using fixed mixers (ribbon blenders or paddle blenders) could lose at least 20% of the shift to cleaning time. As the blender must be fully cleaned and dried before changing recipes your whole production process must be halted. Read our guide to increase efficiency and ensure your resource time is spent producing high volumes of quality products and not cleaning and assembling a blender. Infographic - choose the right blender - understand the key questions you need to ask when choosing your industrial mixer. Savings Calculator - ROI calculator - discover the potential savings you could make by choosing a Matcon system. 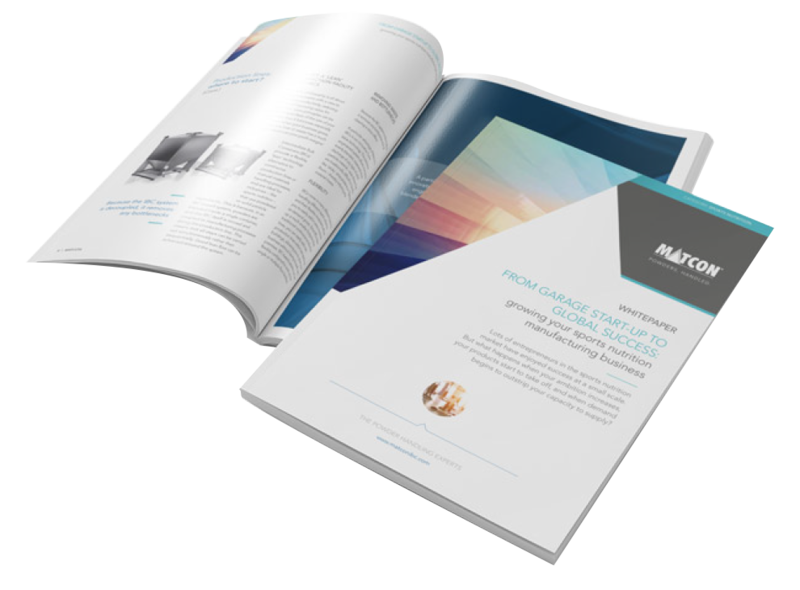 Whitepaper - from start-up to success - learn how to create a flexible manufacturing solution that will take you to sports nutrition success. Factory design - get the best factory fit with the right machinery - use our handy guide to explore three options for your manufacturing setup.